A new study has emerged that may give hope to those who may see themselves as the proverbial “90-pound weakling.” Surprisingly, the remedy can be found in the garden. The study, recently conducted at the Washington School of Medicine in St. Louis, is one of several university trials revealing that a small amount of beet juice is all it takes to beef up your exercise performance and endurance. The researchers found nine heart failure subjects who experienced the typical symptoms — loss of skeletal muscle strength, reduced ability to exercise and even evidence that quality of life was suffering. Each individual exhibited measurable improvement. One of the study’s coauthors, Andrew Coggan, assistant professor of radiology at the university, asserted that’s the type of boost one might get after a few hard months of resistance training. The source of this impressive difference, studies revealed, came from nitric oxide. Was It Spinach That Popeye Reached for, or Beet Juice? One of the most important benefits beet juice offers the heart is that its compounds “de-stiffen” patients’ blood vessels when the individual is at rest. This prevents the heart from having to work so hard and also demonstrates potential value to diabetics. Interestingly, it’s occurred to more than a few scientists that a similar therapy might be useful for lowering blood pressure. When testing was being done on individuals with heart failure, scientists concentrated specifically on the muscles used to extend the knee, looking for improvement in power, which they specified as a combination of force and velocity. This is crucial for athletes in training, such as sprinting or gymnastics. That easy-to-take-for-granted strength is also required by people who want to climb stairs, move furniture around, or simply get up from the toilet, an action that — if they’re unable to accomplish — is what most often puts people in a nursing home. Further studies targeted 12 healthy people in one review; another focused on 13 highly fit college athletes. Individuals in both test groups demonstrated noticeable improvement in their endurance and stamina an hour or two after drinking the beet juice cocktail. Naturally, scientists who’ve been tracking the literal power of beets have also considered other areas and individuals for whom beet juice could be particularly useful. Turn the Beet Around — It’s Good for You! There’s a lot to be said for the humble beet, an easy-to-grow garden vegetable that’s purple-red, inside and out. Cooked and peeled with butter and a little salt, they’re delectable. Pickled with cinnamon and cloves is another favorite preparation. Beets can also be grated and added to salads or cubed to enhance vegetable soups (although the result may have a red tinge). Beets contain an impressive number of advantages, health-wise. The nutrients they contain fight inflammation, lower your blood pressure and detoxify, plus they come with high amounts of infection-fighting vitamin C. Beets may combat cancer, particularly pancreatic, breast, and prostate cancers. Green leafy vegetables are the best source of plant-based nitrates. Nitrates from a plant-based diet are not considered harmful. Beyond just the beetroots, beet greens offer a plethora of vitamins and minerals, too. They’re a great source of fiber — 17 percent of your daily requirements in just one cup — and also vitamin B6, magnesium, potassium, copper, manganese and antioxidants. Beet greens contain more iron than spinach and a higher nutritional value than the vegetable itself. Besides using young beet greens in salads or sautéing with olive oil, juicing beet greens is another excellent way to obtain all these nutrients. Please note that if you’re interested in buying beets to make your own juice, the industry has gone the way of so many crops in the U.S. — toward genetic engineering, according to the Organic and Non-GMO Report.4 This is particularly true with sugar beets. Genetically modified organisms (GMOs) are dangerous for humans on a number of levels. GMOs may alter DNA, potentially cause cancer, and may trigger other “less severe” problems like organ failure, liver and kidney damage, and the list goes on. While the table beets most people eat are not currently genetically engineered, they’re often grown in close proximity to sugar beets, which are often GE, and cross-pollination is known to occur. So when choosing beets to eat, opt for organic varieties whenever possible. Your can also buy your own heirloom beet seeds, because beets are easy to grow. The many nutrients and real health advantages they offer are worth it. Although beets have the highest sugar content of all vegetables, most people can safely eat beet roots a few times a week (and their greens in unlimited quantities). Beet-root juice should be consumed only in moderation. Scientists have been poring over the response beet juice has on muscles since the 1990s. In fact, athletes have been sucking up beet juice before exercising for at least several years, and probably far longer, to increase blood flow and power up performance. 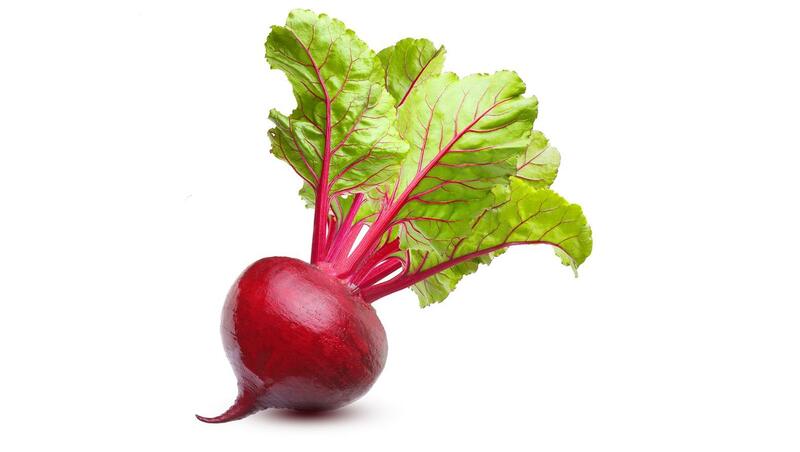 Beets were already on the map for having impressive concentrations of beta carotene. What gives them this kind of power, though — no pun intended — stems from nitrates also found in dark, leafy greens, such as spinach. Once eaten, bacteria on your tongue turns first into nitrite, but then converts to nitric oxide. Beets are a great source of inorganic nitrate. Some of the nitrate ends up in your saliva, when friendly bacteria convert it to nitrite. Elsewhere in the body, the nitrite is converted to nitric oxide, which does … well … a whole bunch of things related to blood flow, muscle contraction, neurotransmission, and so on. Exactly which mechanisms contribute to the performance boost they see in studies remains unclear (and in fact, there are likely multiple mechanisms). One caveat: mess with the friendly bacteria in your mouth by swishing mouthwash or chewing gum, and the nitrate never gets converted to nitrite. Two important takeaways from the Exeter study, the Runner’s World article reported, was that more beet juice is better, and the endurance peak for athletes (or anyone) occurs two to three hours after it’s ingested. Baseline or normal energy levels recur after about 12 hours. Not every study had positive results, however. After observing the improvements knee joints exhibited after test subjects ingested beet juice, a third coauthor of the initial WU analysis, David Proctor, professor of kinesiology and physiology at Noll Laboratory, Penn State, began looking at its effects on subjects’ forearm muscles under beet juice supplementation. While this wasn’t the outcome researchers expected, Proctor maintains that the jury’s still out on blood flow and increased strength in forearm muscles after drinking beet juice. One reason is because the tests were conducted under a narrow range of criteria, and also, he explained, because too many questions still needed answers. Proctor’s investigations are currently involved in examining the effects of beet juice and nitrate supplementation on individuals with peripheral artery disease, an illness suffered by around 20 percent of adults aged 70 and over in the U.S., which significantly limits blood flow to muscles. He hopes the beet juice slurry will help people have improved quality of life in a similar way that dark chocolate has demonstrated. Several manufacturers have found ways to liquefy beetroots and concentrate the nitrate into beetroot juice “shots.” Researchers used a beet juice product manufactured in Britain using concentrated amounts of beet juice so it can be taken without stomach troubles. Referred to as a supplement and now also produced in the U.S., it’s sold in 70 mL shots (between half- and one-third-cup quantities), each equal to 300 mL of straight beet juice in regard to the nitrate. There’s also organic beet juice, but several U.S. companies have jumped on the bandwagon, so beet juice cocktails are sold in a number of stores, including Wal-Mart and Whole Foods. An article on Competitor.com listed five beet juice products designed for endurance athletes, including a “sport bar” and nitrate crystals from beetroots and other veggies that are added to water. Needless to say. Popeye knew what he was doing when he guzzled all that spinach, but think how quickly he could have finished off Bluto if he’d known about beets! 5 Beet Juice: How Much and When? 6 Beetroot juice and exercise: pharmacodynamic and dose-response relationships.